How many birds are there on Earth? It’s a simple enough question: “How many birds are there on Earth?” Not how many different species, but how many different individual birds? Despite the simplicity of this question, arriving at an answer is incredibly difficult. For one thing, birds are very mobile and they tend to move around a lot. Not just the daily flying around their territory but also the annual, long-distance migrations that many bird species undertake. The fact that the same species can occur in different areas of the planet complicates the ability of scientists to keep track bird numbers. For example, a page of illustrations of warblers from “The Birds of Canada” will have the exact same species as a page from “The Birds of Costa Rica”, because, while these warbler species spend most of the year in Costa Rica, they also breed in the boreal forests of Canada. Another complicating factor in arriving at an estimate of the global bird population is that counting birds is not nearly as easy as it seems. It may be straightforward to count the number of birds of each species which come to your backyard feeder during the course of the day. But it is much more difficult to count the same kinds of birds in dense forest, or to count birds who nest in huge colonies with hundreds of thousands of birds. 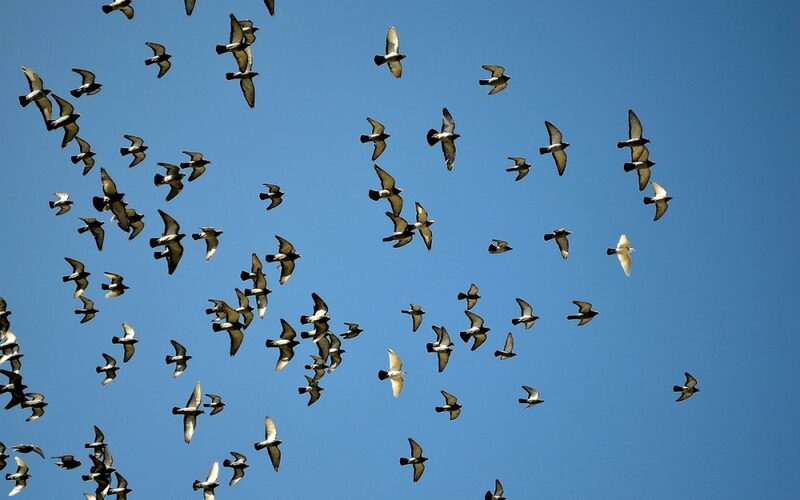 Even getting an accurate count of a large flock of birds flying overhead, like blackbirds or shorebirds, can prove difficult. Here’s an illustration of just how hard counting birds can be. During the 1980’s and 1990’s, a bird biologist undertook a detailed survey of forest birds in the dense jungles of Peru. Each year, he set up mist nets (which are very fine nets designed to catch small birds without harming them) in the same sites along jungle trails. After 15 years, he thought he had a pretty good idea as to the number of birds of each species in that forest during Peru’s rainy, winter season. Then a colleague suggested he set up a rope system to raise the long mist nets off the ground and up into the forest canopy. This was, after all, a jungle with several, dense canopy layers. He undertook the suggestion to prove that he really did have a good handle on the birds of the forest. What he found within 30 minutes of raising the net was that there was an entire community of bird species he did not know were present, despite the fact he had worked in the forest for almost two decades. Because of the difficulties not only with counting the birds we know about but even finding all the birds in a given area, scientists believe it is impossible to know with any real degree of accuracy just how many birds there are on Earth. However, that certainly does not stop many scientists and bird biologists from trying to come up with reasonable estimates of the global bird population. The most abundant wild bird is considered to be the Red-billed Quelea (Quelea quelea), a songbird from the Weaver family. This species is found only in Africa, from the sub-Saharan region down to South Africa, and is considered a serious pest on agricultural crops. Research done by scientists on this species puts their total population at around 1.5 billion birds. However, the most common bird in the world may well be the Red Junglefowl (Gallus gallus), which has evolved over the last few centuries to become known as our domestic chicken. Since every human society on earth consumes chicken to some degree, it is possible this domesticated species is the most widespread bird, and accurate estimates of their global numbers are almost impossible to calculate. A British ornithologist, James Fisher, speculated back in 1951 that the most common seabird in the world was probably the Wilson’s Storm Petrel, and the most common land bird was the House Sparrow (Passer domesticus). He chose the House Sparrow over the Red-billed Quelea because the House Sparrow had been transported all over the world by European settlers and could now be found on about two-thirds of the world’s land mass. They are also a very successful species, becoming abundant wherever they spread. On the basis of these assumptions, and the currently available knowledge at the time, Fisher estimated the global bird population at more than 100 billion birds. However, the true number of birds on earth will always be an elusive figure. Perhaps as elusive and mysterious as the birds themselves.